Yesterday also saw a launch of new messaging App for Android devices which could be used cross platform between iOS devices and Android smart phones or tablets. 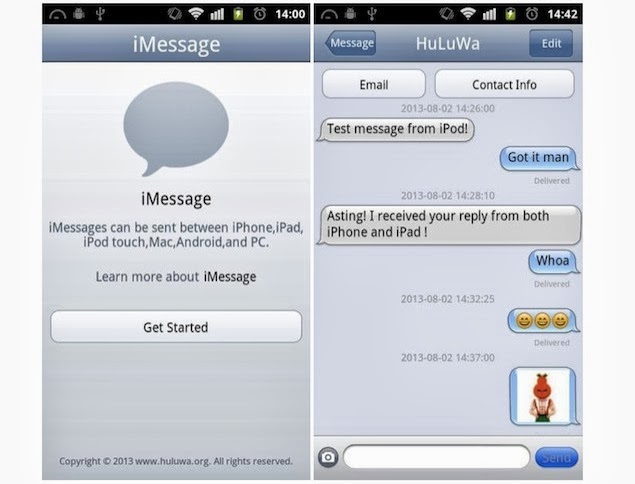 Everything about the App looked good, it was named iMessage which made the users think that this was official Apple iMessage messaging platform. The difference is that Apple's iMessage messaging platform allows users of iOS and Mac devices to exchange text, pictures and other documents free of charge via a data connection and uses Apple's servers with the users' phone numbers and email IDs to process messages through the Messages app, and the closed service is restricted to only Apple devices. As with tons of fake BBMs or the fake BlackBerry Messengers this new App is also a fake. It is published by a developer named Daniel Zweigart and has no connection to Apple or doesn't use Apples authentication or security protocol. In fact the App disguises itself as a Mac Mini to connect to Apple servers. The publisher has cleverly faked the App to look like it is a product from Apple Inc. Even the look and feel of the app is in line with the design of iOS Apps(pre-iOS7). It was first spotted by 9to5Mac. If you have download the App kindly be aware that it has nothing to do with Apple. You may continue to use it till Google notices it and takes it down.